Welcome back, guy. I am very proud of you. thank you, sir. i’m sort of proud of me too! thanks. 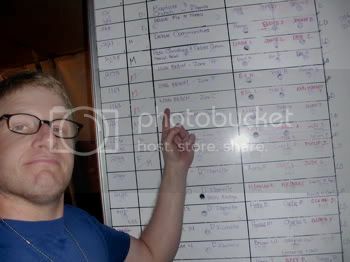 that’s me on my last day, pointing to the long beach “c” run on the job board. i am too. it meant a lot to me to see that in the three weeks i was there, distinct improvement had been made in people’s lives and they were on the verge of being able to take care of themselves again. Put that on your resume’ ! i will, if i ever need one. Welcome back, sir! Hope you can get a few days of well deserved rest, and enjoy the privacy and relaxation of some leisurely early morning “constitutionals” (as I like to call them). i have indeed returned to my old ways in the john. so nice. actually, one slightly disappointing thing was how quickly i reacclimated to the flush toilet. i thought it might take me a little time to get used to it, but, no, i knew exactly what to do, and accepted the miracle of indoor plumbing without much thought. i sure don’t miss the port-a-potties, though; i’ll tell you that! It’s just like riding a bike – you never forget!